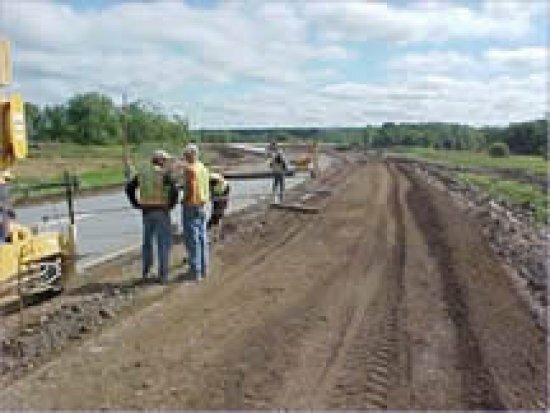 Synopsis of Work: This project consisted of 4.7 miles of reconstruction on US 18 through Canton to the Iowa Line. Construction started on March 17, 2003, with work sequenced in eight phases. The majority of the project was built half at a time to maintain traffic through the project. 2.7 miles of temporary road widening was constructed to provide enough roadway width to accommodate traffic. Portions of the road were closed to traffic due to very narrow roadway widths and realignment of the roadway. This project involved 14 lane miles of 8” non-reinforced PCCP, and 7 miles of 6 ft. wide asphalt shoulder. An aggressive schedule was used to complete this project on time, as well as meeting interim completion dates. Innovative construction techniques and state of the art equipment was used to produce a quality PCC paving project. This project was open to traffic on October 31, 2003.